"Scrapping" redirects here. It is not to be confused with scraping. "Scrap metal" redirects here. For other uses, see Scrap Metal (disambiguation). Scrap metal originates both in business and residential environments. Typically a "scrapper" will advertise their services to conveniently remove scrap metal for people who don't need it. 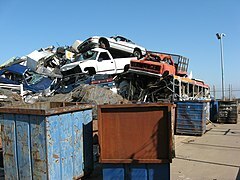 Scrap is often taken to a wrecking yard (also known as a scrapyard, junkyard, or breaker's yard), where it is processed for later melting into new products. A wrecking yard, depending on its location, may allow customers to browse their lot and purchase items before they are sent to the smelters, although many scrap yards that deal in large quantities of scrap usually do not, often selling entire units such as engines or machinery by weight with no regard to their functional status. Customers are typically required to supply all of their own tools and labor to extract parts, and some scrapyards may first require waiving liability for personal injury before entering. Many scrapyards also sell bulk metals (stainless steel, etc.) by weight, often at prices substantially below the retail purchasing costs of similar pieces. A scrap metal shredder is often used to recycle items containing a variety of other materials in combination with steel. Examples are automobiles and white goods such as refrigerators, stoves, clothes washers, etc. These items are labor-intensive to manually sort things like plastic, copper, aluminum, and brass. By shredding into relatively small pieces, the steel can easily be separated out magnetically. The non-ferrous waste stream requires other techniques to sort. In contrast to wrecking yards, scrapyards typically sell everything by weight, instead of by item. To the scrapyard, the primary value of the scrap is what the smelter will give them for it, rather than the value of whatever shape the metal may be in. An auto wrecker, on the other hand, would price exactly the same scrap based on what the item does, regardless of what it weighs. Typically, if a wrecker cannot sell something above the value of the metal in it, they would then take it to the scrapyard and sell it by weight. Equipment containing parts of various metals can often be purchased at a price below that of either of the metals, due to saving the scrapyard the labor of separating the metals before shipping them to be recycled. Scrap prices may vary markedly over time and in different locations. Prices are often negotiated among buyers and sellers directly or indirectly over the Internet. Prices displayed as the market prices are not the prices that recyclers will see at the scrap yards. Other prices are ranges or older and not updated frequently. Some scrap yards' websites have updated scrap prices. In the US, scrap prices are reported in a handful of publications, including American Metal Market, based on confirmed sales as well as reference sites such as Scrap Metal Prices and Auctions. Non-US domiciled publications, such as The Steel Index, also report on the US scrap price, which has become increasingly important to global export markets. Scrap yards directories are also used by recyclers to find facilities in the US and Canada, allowing users to get in contact with yards. With resources online for recyclers to look at for scrapping tips, like web sites, blogs, and search engines, scrapping is often referred to as a hands and labor-intensive job. Taking apart and separating metals is important to making more money on scrap, for tips like using a magnet to determine ferrous and non-ferrous materials, that can help recyclers make more money on their metal recycling. When a magnet sticks to the metal, it will be a ferrous material, like steel or iron. This is usually a less expensive item that is recycled but usually is recycled in larger quantities of thousands of pounds. Non-ferrous metals like copper, aluminum, and brass do not stick to a magnet. Some cheaper grades of stainless steel are magnetic, other grades are not. These items are higher priced commodities for metal recycling and are important to separate when recycling them. The prices of non-ferrous metals also tend to fluctuate more than ferrous metals so it is important for recyclers to pay attention to these sources and the overall markets. Great potential exists in the scrap metal industry for accidents in which a hazardous material present in scrap causes death, injury, or environmental damage. A classic example is radioactivity in scrap; the Goiânia accident and the Mayapuri radiological accident were incidents involving radioactive materials. Toxic materials such as asbestos, and toxic metals such as beryllium, cadmium, and mercury may pose dangers to personnel, as well as contaminating materials intended for metal smelters. Many specialized tools used in scrapyards are hazardous, such as the alligator shear, which cuts metal using hydraulic force, compactors, and scrap metal shredders. 90% savings in raw materials used. 86% reduction in air pollution. 40% reduction in water use. 76% reduction in water pollution. 97% reduction in mining wastes. 1,115 kg of iron ore.
Aluminium savings of 95% energy. Copper savings of 85% energy. Lead savings of 65% energy. Zinc savings of 60% energy. The metal recycling industry encompasses a wide range of metals. The more frequently recycled metals are scrap steel, iron (ISS), lead, aluminium, copper, stainless steel and zinc. There are two main categories of metals: ferrous and non-ferrous. Metals which contain iron in them are known as ferrous. Metals without iron are non-ferrous. Common non-ferrous metals are copper, brass, aluminum, zinc, magnesium, tin, nickel, and lead. Usable coins can be deposited in banks. Damaged US coins can be redeemed for money via the Mutilated Coin Redemption Program. Precious metals are metals with a high market value in any form, such as gold, silver, and platinum group metals. Exotic metals contain rare elements such as cobalt, mercury, titanium, tungsten, arsenic, beryllium, bismuth, cerium, cadmium, niobium, indium, gallium, germanium, lithium, selenium, tantalum, tellurium, vanadium, and zirconium. Some types of metals are radioactive. These may be "naturally occurring" or formed by nuclear reactions. Metals that have been exposed to radioactive sources may also become radioactive in settings such as medical environments, research laboratories, and nuclear power plants. OSHA guidelines should be followed when recycling any type of scrap metal to ensure safety. Ferrous metals are able to be recycled, with steel being one of the most recycled materials in the world. Ferrous metals contain an appreciable percentage of iron and the addition of carbon and other substances creates steel. In the United States, steel containers, cans, automobiles, appliances, and construction materials contribute the greatest weight of recycled materials. For example, in 2008, more than 97% of structural steel and 106% of automobiles were recycled, comparing the current steel consumption for each industry with the amount of recycled steel being produced (the late 2000s recession and the associated sharp decline in automobile production in the US explains the over-100% calculation). A typical appliance is about 75% steel by weight and automobiles are about 65% steel and iron. The steel industry has been actively recycling for more than 150 years, in large part because it is economically advantageous to do so. It is cheaper to recycle steel than to mine iron ore and manipulate it through the production process to form new steel. Steel does not lose any of its inherent physical properties during the recycling process, and has drastically reduced energy and material requirements compared with refinement from iron ore. The energy saved by recycling reduces the annual energy consumption of the industry by about 75%, which is enough to power eighteen million homes for one year. According to the International Resource Panel's Metal Stocks in Society report, the per capita stock of steel in use in Australia, Canada, the European Union EU15, Norway, Switzerland, Japan, New Zealand and the US combined is 7,085 kilograms (15,620 lb) (about 860 million people in 2005). Basic oxygen steelmaking (BOS) uses 25–35% recycled steel to make new steel. BOS steel usually contains lower concentrations of residual elements such as copper, nickel, and molybdenum, and is therefore more malleable than electric arc furnace (EAF) steel, and is often used to make automotive fenders, tin cans, industrial drums, or any product with a large degree of cold working. EAF steelmaking uses almost 100% recycled steel. This steel contains greater concentrations of residual elements that cannot be removed through the application of oxygen and lime. It is used to make structural beams, plates, reinforcing bar, and other products that require little cold working. Downcycling of steel by hard-to-separate impurities such as copper or tin can only be prevented by well-aimed scrap selection or dilution by pure steel. Recycling one metric ton (1,000 kilograms) of steel saves 1.1 metric tons of iron ore, 630 kilograms of coal, and 55 kilograms of limestone. Turnings – Remains of drilling or shaping steels. Also known as "borings" or "swarf"
Manganese steel – Non-magnetic, hardened steel used in the mining industry, cement mixers, rock crushers, and other high-impact and abrasive environments. The hulls of ships, with any usable equipment salvaged and removed, can be broken up to provide scrap steel. For a time countries in south Asia carried out most ship breaking, often using manual methods that were hazardous to workers and the environment. International regulations now dictate treatment of old ships as sources of hazardous waste, so ship breaking has returned to ports in more developed countries. In 2013, about 29 million tons of scrap steel was recovered from broken ships. Some of the scrap can be reheated and rolled to make products such as concrete reinforcing bars, or the scrap may be melted to make new steel. The scrap industry was valued at more than $90 billion in 2012, up from $54 billion in 2009 balance of trade, exporting $28 billion in scrap commodities to 160 countries. Since 2010, the industry has added more than 15,000 jobs, and supports 463,000 workers, both directly and indirectly. In addition, it generates more than $10 billion in revenue for federal, state, and local governments. Scrap recycling also helps reduce greenhouse gas emissions and conserves energy and natural resources. For example, scrap recycling diverts 135 million short tons (121,000,000 long tons; 122,000,000 t) of materials away from landfills. Recycled scrap is a raw material feedstock for nearly 60% of steel made in the US, for almost 50% of the copper and copper alloys produced in the US, for more than 75% of the US paper industry's needs, and for 50% of US aluminum. Recycled scrap helps keep air and water cleaner by removing potentially hazardous materials and keeping them out of landfills. ^ "Benefits of Recycling Scrap Metal". Retrieved 2011-04-04. ^ Hartman, Roy A. (2009). "Recycling". Encarta. Archived from the original on 2008-04-14. ^ "Steel Recycling Rates at a Glance" (PDF). Archived from the original (PDF) on 2010-02-20. Retrieved 2010-02-20. ^ "Recycling steel appliances". Stell Recycling Institute. 2014. Retrieved 2017-04-06. ^ "End-of-life vehicle recycling process". Retrieved 2016-01-18. ^ "Facts About Steel Recycling". Archived from the original on 2009-08-25. Retrieved 2009-07-18. ^ M.A. Reuter; K. Heiskanen; U. Boin; A. Van Schaik; E. Verhoef; Y. Yang; G. Georgalli, eds. (November 2005). "13" (Book). The metrics of material and metal ecology: harmonizing the resource, technology, and environmental cycles. Developments in Mineral Processing. 16. Elsevier. p. 396. ISBN 978-0-444-51137-9. ^ "Information on Recycling Steel Products". WasteCap of Massachusetts. Archived from the original on 2007-10-11. Retrieved 2007-02-28. ^ "Ferrous Scrap Metal". Retrieved 2011-04-24. Wikimedia Commons has media related to Scrap metal. Look up scrap in Wiktionary, the free dictionary.